"Fungus, fungus. Not algae. Algae requires light to survive (can be a plant or a symbiotic creature that has photosynthetic cells). As far as I know, no light reaches the fuel unless you have a clear acrylic hood and a clear pre-filter." I started making some corrections, and realized I was turning into a spammer because there are so many threads that refer to algae in one's fuel system. Of course. That's what the " " was for. Then again, I might just have fungus in my brain (not algae, since there's no light :-) ). cause i liked the sound of it. but some folks raised such a stink about it i had to switch over to fungi so they wouldnt think i was a bonehead architect. heh heh. now i am getting to like saying fungi too. Algae , Fungus Amongus ~ WHO CARES ? The bottles are labled wrong...what's a sommat? Ok, I'll bite, algae sounds pretty good when hungry enuf but....what's the latest news Pete? Those storms knocked me out all day yesterday and spent the day getting records from Augusta Med to take to UVA tomorrow so am missing out on the soap opera...as the wrench turns. How's your head fred?...more important is how's the bolt bit what was init? Fugus is used to make BEER! It's a colloquial term , prolly from England , it means ' something ' . I don't know...... If we change algae to fungus so that everything is perfect around here, we'd also have to go chase down all the timing chain "stretch" threads and change them to "wear". That would probably start someone to thinking about changing all the spelling errors that occur on the forum. Where would it all end? Just so long as they don't break. Picture of the bad guys. 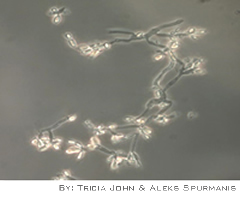 The fungi is Hormoconis Resinae, previously called Cladosporium Resinae. The fungi breaks down stable compounds such as the benzene ring structures of fuel to simpler linear hydrocarbons that can then be broken up further by sulphur-dependant Pseudomona Aeruginosa (bacteria) species. Collectively, the microbes will over time greatly impair the ignition characteristics of fuel. Cladosporium resinae also produces a bio-surfactant that degrades fuel by allowing water to partially mix with it creating an emulsion, which affects the combustive qualities of the fuel, impacting the performance characteristics of the engine and increasing fuel consumption. The problems is that the fungi multiply rapidly into dense mats. Their strong acidic excreta, when released into water and fuel, become extremely corrosive to the whole fuel system. A biocide kills the critters, but leave their dead bodies behind which are what do most of the clogging. Not sure if the Startron does what it says. I spoke to an engineer at Star-Brite and they claim it allows the critters to be passed through filters and burned. I know, too much information for a lousy microbe. How about we just call 'em bugs?